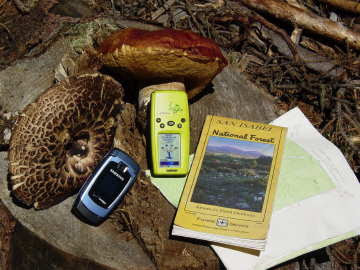 Hawk's wing mushroom, king bolete mushroom, Samsung mobile phone, Garmin Gecko GPS unit, San Isabel National Forest map, topographic map. Here, in the increasingly mapped, sanitized and sold Southwest, geocaching is on a par with surveying. Some of those nasty zealot mesquite-huggers have been known to yank geocaches as gleefully as they once did stakes festooned with Day-Glo plastic. So that is one argument against carrying a GPS unit: that they turn the self-created nonhuman world into just an outdoor gym -- the kind used by Spandex-clad athletes who run to the top of a fourteener, pausing only to check their elapsed times and heart rates on various digital gadgets. Gadgets can cause you be less observant, less present, less aware, less involved. With map and compass, you at least must learn relationships, a basic geometry of azimuth and distance. Or you can rely soley on GPS and end up like this. At the same time, I will admit that I own one. I can justify setting a couple of waypoints when making cross-country walks in thick forests with few landmarks. But then I always try to test myself against the GPS as well. Its compass readings are good, but I have gotten drastically different distance readings when walking the same trail twice. Altitude readings can vary as well -- who knew the Earth's crust was so elastic? And the biggest barrier to knowing what is around me is not the gadget but my own buzzing brain. As with anything, common sense and moderation should be applied. There are extremes at both ends of any argument. 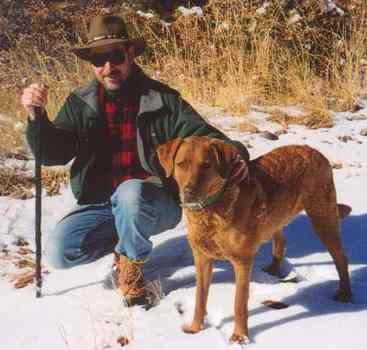 I own and use a GPS, as well as a map and compass and I'm proficient with both methods. I geocache (is that a verb?) with my wife and three daughters, although we don't do it in wilderness. My GPS definitely has a purpose when it comes to backpacking and hunting. No, I don't hike with my head down, staring at the screen. It gets turned on to verify the work I'm doing with my compass, and mark waypoints for future campsites, mark waypoints for deer and antelope carcasses that I've cached or hung in trees while I haul meat back to my truck in the backpack. I also mark waypoints for camp while hunting, because I leave camp in the morning in the dark and return in the dark as well. Sure is nice knowing how to get back. Does that make me "less connected" with the wilderness? Nope. Not in my estimation. Moderation and ethical use. I see a lot of purists spend quite a bit of time on a slippery slope. If you're moving around in the dark, a GPS unit might definitely help. But from teaching in computerized classrooms, I know how hard it is for some people to look away from the screen. As usual the question is For Who? I'm all in favor of peole being able to live out their puritan dreams, sure fill yer boots but why do they feel the need to extend their choices into the lives of others?